This review was first posted on Music, Books and TeaI can’t say that I’ve ever really been a fan of dragons. I’ve never really had any interest in them at all. That has certainly changed after reading Seraphina. 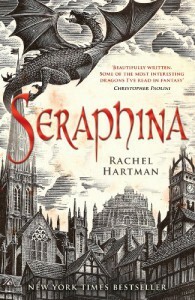 Whilst I can’t say I’m a full-blown dragon fan now, I can say that I’m certainly more interested in reading about them!I loved Seraphina, the main character. There was just something about her that really connected me to her. 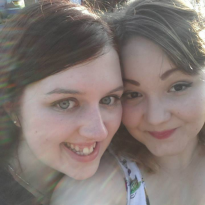 She had this huge secret that she had to keep, regardless of the circumstances, but that doesn’t stop her from being true to herself, which I thought was fantastic. The garden she kept in her mind, full of interesting characters, some of which who played a large role in the story, was a really interesting twist to Seraphina’s story, and I really enjoyed reading the scenes that detailed the garden. Alongside Seraphina, this book was full of interesting characters who I also loved. Prince Lucian Kiggs was a fantastically well-written character, and I loved that he wasn’t a typical love interest in that he didn’t want to break everyone’s heart. (That’s all I can say on the matter without it being a spoiler!) Princess Glisselda was also incredible, and her acceptance and sheer determination to make sure her land of Goredd would remain hers was truly commendable. Orma, Seraphina’s Uncle, was also a favourite of mine, purely because of the humour he managed to inject into the story just by being himself. He was also incredibly knowledgeable and one of Seraphina’s rocks to lean on, and I really hope we get to see more of him in the rest of the series. The writing in Seraphina was brilliant, but at the same time, it was one of the book’s downfalls. There is no doubting that Rachel Hartman is a fantastic author, and the world she managed to create was amazing, which you’d expect from a fantasy book. But for me, reading Seraphina was a bit like wading through treacle in the fact that it felt like I was getting absolutely nowhere with the book. Perhaps it was the sheer volume of information that I had to process, but sometimes it just felt like the book was never going to end! That said, the final pages of the book did speed past for me, and really made me eager for the sequel to release!Seraphina is a beautifully written book full of fantastic characters that I easily fell in love with. Despite my niggles with it, I’m incredibly excited to see where Hartman takes Seraphina, Kiggs and Glisselda next in their quest to protect the land of Goredd.